Bringing a great comedy from page to stage is a delicate operation, and far too often the patient dies. Not so with “Abigail’s Party”at San Francisco Playhouse. Mike Leigh‘s comedy is delivered here by an expert ensemble with laughs intact. This is one funny night out. Our pleasure begins watching the delectable Susi Damilano as Beverly, dancing about her house in preparation for the arrival of several guests for cocktails. Ms. Damilano holds the stage by herself, with no dialogue, presenting a little play of her own that amounts to a prologue for what is to follow. It is a tour de force and on opening night, before a word of dialogue had been spoken, Ms. Damilano had her audience in stitches. “Abigail’s Party” is not, in fact, the subject of the play, but rather the background circumstance that creates the onstage situation. Abigail (whom we never meet), is the 15-year-old daughter of Beverly’s neighbor Sue, who is throwing a party for her friends. Beverly and her husband Laurence have invited Sue and another neighboring couple over for cocktails so that Abigail can party without adults hanging around. Of course, everybody is worried that Abigail’s party will get out of hand, but it is the adults, downing cocktail after cocktail after cocktail and tearing into each other in a robust, horrifying, and screamingly funny no-holds-barred game of one-upmanship that are the real party animals. 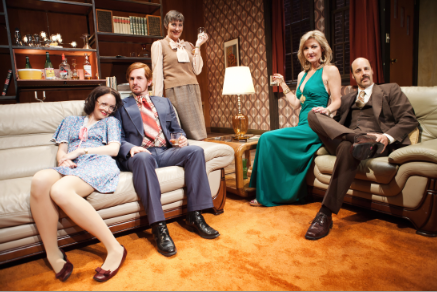 The cast of “Abigail’s Party” from l to r: Allison Jean White as Angela, Patrick Kelly Jones as Tony, Julia Brothers as Sue, Susi Damilano as Bev and Remi Sandri as Laurence. Photo Credit: Jessica Palopoli. In the course of a very funny evening, three marriages are dissected, neighborhood soap operas unraveled and weaknesses revealed and exploited. This is a play of character more than of plot and thus depends on exceptional acting to succeed. Each actor in this production hits it out of the ballpark. Susi Damilano’s shameless vamping of Tony the neighbor, husband of the guileless Angela (a very capable Allison Jean White), is over-the-top but never divorced from reality. As Tony, Patrick Kelly Jones is deliciously stiff and uncomfortable, making the most of a vocabulary of nervous grunts. As Beverly’s embarrassed husband, Laurence, Remi Sendri is convincingly desperate as he tries to maintain his dignity and assert his claims to status. Bay area favorite, Julia Brothers, turns in a real gem of a comedic performance as Abigail’s worried mother, Sue. As she tries, and increasingly fails, to maintain her composure under an onslaught of gin and tonics foisted upon her by her aggressive hosts, Brothers’ gradual drunken deterioration is a marvel of subtle physical comedy. She can communicate as much with her expressive, startled eyes than many actresses can with their entire torso. Her work here is an unqualified delight. As one should expect from playwright Mike Leigh, who has authored such thoughtful screenplays as “Topsy-Turvy” and “Secrets & Lies“, the comic shenanigans are not without serious implications and by play’s end some unexpected hairpin turns into drama have been accomplished. The actors handle all of it with aplomb. “Abigail’s Party” by Mike Leigh, produced by SF Playhouse. Director: Amy Glazer. Set Design: Bill English. Sound Design: Brendan Aanes. Lightning Design: Dan Reed. Costume Design: Tatjana Genser. Properties: Jacqueline Scott. Dialect Coach: Lynne Soffer. Choreography: Kimberly Richards. Hair Design: Angels at Alcheme Salon. Susan: Julia Brothers. Beverly: Susi Damilano. Patrick Kelly Jones: Tony. Remi Sandri: Laurence. Allison Jean White: Angela.